Manchester United manager Jose Mourinho is reportedly pushing for his club to strengthen up front this summer with a transfer swoop for Tottenham striker Harry Kane. According to Diario Gol, the Red Devils boss feels he cannot achieve what he wants to with this current crop of players after a disappointing FA Cup final defeat at the hands of Chelsea on Saturday. United were without Romelu Lukaku on the day as he could only make the bench, and Mourinho was quoted afterwards as saying he felt his side had the better of the game. ‘I don’t think they deserved to win,’ he told BBC Sport. ‘I congratulate (them) because I am a sportsman, they scored one more goal than us, they got the cup, so I have to do what my job asks me to do. ‘I have to be respectful not just because they were my previous club but because they are the opponent that won the cup, but I think we deserved to win, we were the best team. Still, they couldn’t take the chances that came their way as Marcus Rashford looked somewhat unconvincing filling in for Lukaku at centre-forward, while Paul Pogba missed a glorious chance in the second half. 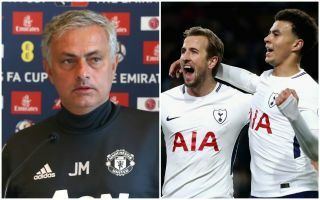 Diario Gol claim Mourinho is requesting a big-name attacking signing this summer and that Kane is one of the names on his agenda as he seeks to add a ‘killer’ to his squad. The England international scored 41 goals in all competitions this season and would surely be an upgrade on Lukaku and on the club’s other crop of forward players right now. Still, Spurs won’t want to lose their best player to a rival and shouldn’t be under too much pressure to after qualifying for the Champions League yet again this term.